AT YOUR FINGERTIPS. euroCARE IVF Clinic in Cyprus is highly motivated to offer you family building assistance that fits your individual needs — to help you create lifelong memories. 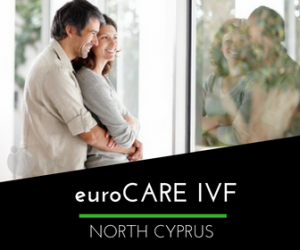 Our experienced fertility team, compassionate nurses, researchers and support staff are committed to your family-building options — inside the all-encompassing IVF clinic located in the Turkish Republic of Northern Cyprus. Our top-rated fertility packages are at unmatched costs and backed by unsurpassed personal service. Here at euroCARE IVF, we do not pretend that planning your IVF treatment is plain sailing. You will need to organize the tests, decide which month you wish to come for treatment, as well as organize time from work, etc. There is a great deal of planning and organization needed, however please be assured we will do everything possible to make your journey run smoothly — with as little stress as possible. • Having the clinic driver collect you for all your appointments with the Doctor. • The clinic driver will also take you to the pharmacy during your journey when needed. • Keeping you fully up to date with how your treatment is progressing when you are in and away from the clinic. • Organizing a car to take you back to the airport when it is time to depart. • Continuing to answer any questions you have anytime. • 24 hour patient care here in North Cyprus. Please note: Some things we cannot include for example are the medication and flights. This for the simple reason that we do not know which or how much medication you will need during your cycle as it varies from patient to patient. Your flights will depend which airport you are flying from, the time of year, and availability etc. Flights are generally cheaper when they are booked from the country you are flying from. The treatment packages have been organized pertaining to each treatment. To learn more details please contact one of our expert coordinators and they will be happy to send you more details. We are honored to offer high-quality, affordable fertility packages to patients traveling from the United Kingdom and across the globe. Please take the time to explore the different packages we offer.